Stock Exchange: Bear Trap Rally? The Dow Jones is up four trading sessions in a row, the most consecutive up days since September. But is it a bear trap? Markets rarely make v-shaped recoveries. Even though they sometimes seem at odds with each other, prudence and aggressiveness are two necessary ingredients of trading success. Although it is an absolutely hated stock, General Electric shares are increasingly attractive for both traders and investors. Our regular trading participants offer specific trading ideas reflecting their contrasting styles. Review: How Much Cash Are You Keeping On The Sidelines? Our previous Stock Exchange asked the question: How Much Cash Are You Keeping On The Sidelines? We noted the increased market volatility and asked readers if they were keeping more cash, less cash, or if it was simply trading and investing as usual. We also discussed the optionality of cash, and its quality as an attractive hedge considering there is no chance of unforeseen losses if markets turn against you. This Week: Are You Watching Out For Bear Trap Rallies? The Dow Jones is up four trading sessions in a row, the most consecutive up days since September. But is it a bear trap rally? Markets rarely make v-shaped recoveries, yet we usually hear only about the rare "bottom caller" that gets it right, instead of the many more that call false bottoms. Prudence is all about staying in the game with proper risk management, position sizing, and selectivity of trading. Aggressiveness is all about making the most of the game with proper risk taking, position sizing, and assertiveness of trading. For our own trading models, we get aggressive when conditions are right, but exhibit prudence when they're not. For example, our momentum models need momentum to work best. And four consecutive (yet volatile) up days in a row aren't exactly a trend compared to the myriad of highly volatile down day in recent months. "All the minutes are doing is confirming what they had already hinted at... The Fed speak before the minutes was like a fire hose to calm down the markets." From our perspective, recognizing when risk is no longer excessive pays off much better than trying to do bottom-calling. In particular, when your system is momentum based, you need to see some momentum. Note: This week's Stock Exchange is edited by Blue Harbinger, a source for independent investment ideas. 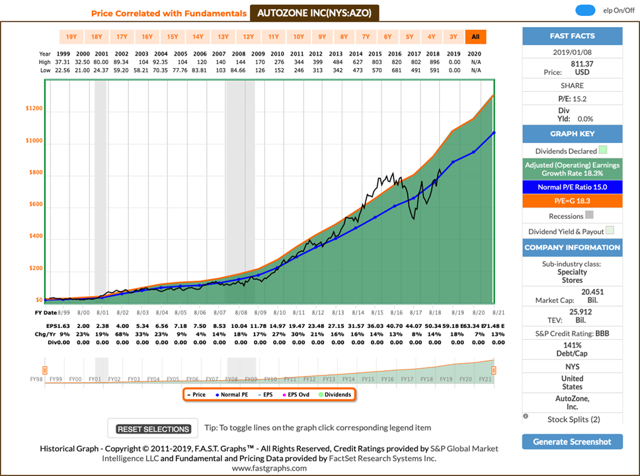 Holmes: Being the aggressive yet prudent dip-buyer that I am, I bought shares of AutoZone (AZO) this week. And as you know, I typically hold for about 6 weeks. Blue Harbinger: I was about to tell you I like that purchase, being a bit of a dip-buyer myself, until you reminded me of the 6 week thing. You've got to be quite exacting to have comfort on your "dip buys" if you're holding for such a short period. I like to pay more attention to the long-term fundamentals. For example, here is a look at the long-term price correlated with fundamentals from Fast Graphs. See the relationship, for example, with price to the price-earnings ratio? 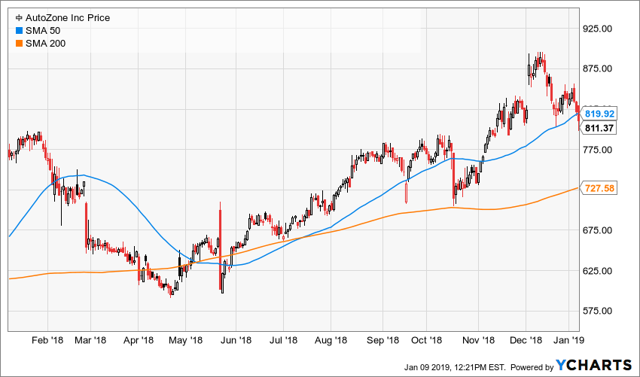 Holmes: Buy and Hope? Yawn. I'll stick to my technical dip-buying strategy. It's objective and unbiased, not emotional or narrative-prone (like you). Plus, my strategy is less correlated with the long-term ups and down of the market--a big plus for diversification benefits. BH: Suit yourself, Holmes. I admire your contrarian bravery. I'm also glad current market conditions are conducive to your trading strategy. And at least if this is a bear trap rally, I know you've got price targets and stop loss orders in place. Your time horizon should help you avoid the dangers of trying to catch a falling knife if this is indeed a bear trap rally. Anyway, how about you Road Runner and Athena--do you two momentum traders have any trades to share this week? Road Runner: No trades. We need a little more proven market momentum before we start placing trades. It's called being prudent. BH: I can respect that. This market has been nuts lately. How about you, Felix--do you have anything to share? Felix: Yes. This week I ran the 30 stocks of the Dow Jones Industrial Average through my technical model, and I have ranked the top 20 for you in the following list. BH: Thanks for that ranking, Felix. And thanks also for including General Electric (GE) in the list, per my request, even though it got kicked out of the Dow last year. It's interesting to me that GE ranked high on your list. You are a momentum trader, right? You must be talking about its momentum so far this year, because I think of it as more of a "dip-buying" opportunity after its horrendous 2018. Felix: Yes, GE has been terrible, but up a bit so far this year (buying following last year's tax loss selling, perhaps?). And just so you remember, I am a momentum trader. I typically hold for around 66 weeks. I use stops and pay attention to macro conditions for risk management reasons. And as you know, I recently exited all my trades because near-term conditions have gotten a bit unhealthy. My exit is not a bet on market direction--just risk management. Or being "prudent," as you keep saying. BH: Well maybe I'm being a little more aggressive than prudent, but GE is tempting to me here for the price appreciation potential. It seems like this stock has gotten so cheap because the market absolutely hates it; the shares have experienced a historic fall, the quarterly dividend has been reduced to only a penny, and they’re on their 3rd CEO in the last two years. Specifically, almost half of the 22 analysts covering the stock now have buy ratings, and the price target ($11.52) is 33% higher than the current share price. Also, there's been news that private equity group Apollo Global Management is showing interest in buying GE’s Jet Leasing business, which is worth as much as $40 billion. 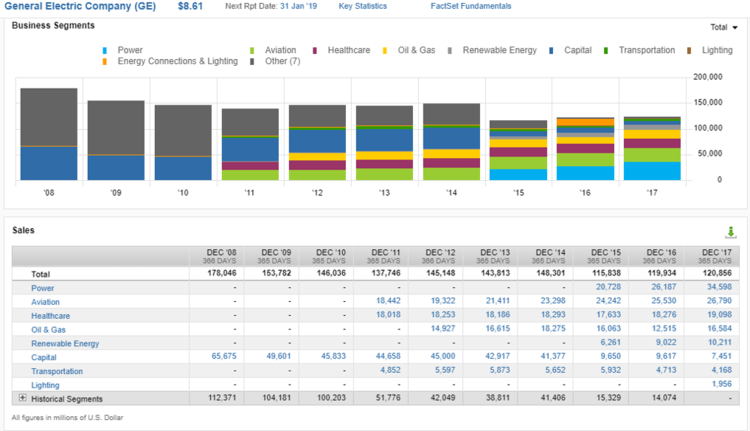 Not only could this create a lot of much needed near-term cash flow for GE, but it’s a good indication of just how beat up General Electric shares actually are (Apollo and private equity in general wouldn’t be interested if GE’s market value wasn’t extremely beat up—they like to buy very low). Further still, despite the market’s pure hatred for GE’s stock, the company is expected to generate powerful cash flows from operations in future years (according to analysts) as shown in the following table. "This is not a turnaround story. This is a story of disentangling a company and selling off its pieces for the best prices they can get." Damodaran is still buying shares of [GE] because the stock could see a "significant recovery" if it "plays its cards right." Oscar: Thanks for that info on GE, Felix and Blue Harbinger. But if you're interested, I also have a ranking to share. This week I ran our "High Liquidity ETFs with Price*volume over 100 million" through my model, and the top 20 are ranked in the following list. BH: Interesting. And remind us, what is your trading strategy? Oscar: I am into momentum. I typically hold for 6 weeks, and then I usually rotate into a new sector or style ETF. BH: I see a lot oil ETFs on your list. For example, VanEck Vectors Oil Services ETF (OIH), SPDR S&P Oil & Gas Exploration & Production ETF (XOP) and the United States Oil ETF (USO). In my mind, oil is a contrarian play because it's down so much in recent months. However, considering your typical holding period is only 6 weeks, and considering oil is up a bunch in the last week--maybe that's the momentum to which you're referring. Interesting ideas, Oscar; thanks for sharing. 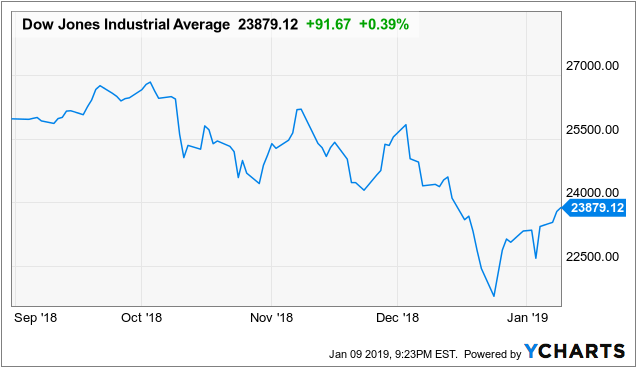 Even though this is the fist time in months that the Dow is up four trading days in a row, that doesn't necessarily mean momentum has shifted upwards. Markets rarely form a v-shaped bottom, and correctly calling one is usually an unsuccessful and dangerous endeavor. Rather, achieving the right balance between aggressiveness and prudence is usually the much better approach. And so too is always sticking to a market strategy that is consistent with your own personal trading goals. Readers are welcome to suggest individual stocks and/or ETFs to be added to our model lists. We keep a running list of all securities our readers recommend, and we share the results within this weekly "Stock Exchange" series when feasible. Send your ideas to "etf at newarc dot com." Also, we will share additional information about the models, including test data, with those interested in investing. Suggestions and comments about this weekly "Stock Exchange" report are welcome. Your can also access background information on the "Stock Exchange" here. Disclosure: I am/we are long AZO. I wrote this article myself, and it expresses my own opinions. I am not receiving compensation for it. I have no business relationship with any company whose stock is mentioned in this article.